This week, Kourtney Kardashian appeared on NBC’s Today Show to voice her support for EWG’s #BeautyMadeBetter campaign. We launched the campaign to help shine a light on the need for real cosmetics safety reform, urging Congress to pass the first federal law to regulate the cosmetics industry in more than 80 years. The public health crisis surrounding toxic fluorinated chemicals, or PFAS, has received national attention, with millions of Americans exposed to the toxic substances through food, cookware, drinking water and even personal care products. But exposure to PFAS first takes place where you might not expect. 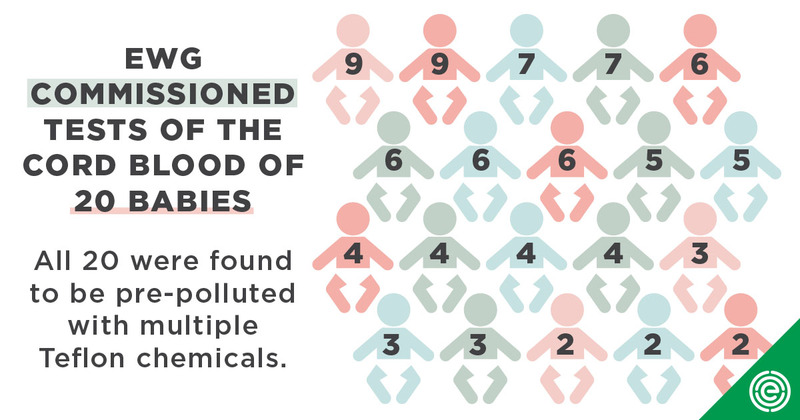 This week EWG published an analysis of umbilical cord blood testing we previously commissioned, which showed that every baby we tested was pre-polluted with this class of chemicals before leaving the womb. Despite the public outcry over the ballooning PFAS crisis, the Trump Environmental Protection Agency continues to drag its feet in putting forth a serious plan to address it. In the past two weeks, Politico has reported that the EPA has indicated it will not set a legal limit for PFAS chemicals in public drinking water. It has also put a former chemical and fossil fuel industry executive in a leading role shaping the agency’s plan to address the ongoing crisis. The man President Trump tapped to head the EPA, former coal industry lobbyist Andrew Wheeler, saw his nomination advance, passing the Senate committee this week. Wheeler’s full Senate confirmation vote is expected in the coming weeks. In more uplifting news out of the nation’s capital, EWG officially endorsed the Green New Deal, introduced on Thursday by Sen. Edward Markey (D-Mass) and Rep. Alexandria Ocasio-Cortez (D-NY). EWG joined more than 640 other organizations in calling on Congress to use the Green New Deal to push ahead with an ambitious and reachable goal of transitioning the entire U.S. electricity grid to 100 percent renewable energy sources by no later than 2035. We also assessed whether the U.S. has done enough to promote safe cellphone use by kids, conducted pesticide testing in San Francisco drinking water, reviewed a recent study that shows ties between cosmetic chemicals and childhood lung damage, and pushed back against the Department of Energy’s downplaying of growing renewable energy revolution. Ban on Oxybenzone and Octinoxate in Key West, Fla. While many sunscreen formulations still contain oxybenzone and octinoxate — including some from Banana Boat, Coppertone and Australian Gold, according to the Environmental Working Group — brands have increasingly begun dropping the chemicals from their products, both for environmental and human health reasons. This sunscreen has a perfect score on EWG, and doesn’t contain any biologically toxic chemicals. It is water-resistant for up 80 minutes and is absorbed easily by your skin. The brand also makes a face sunscreen (amazon.com, $12). Reprinted by MSN. The consumer health and environment watchdog Environmental Working Group (EWG) also has a great guide for healthy sunscreens here. If you want to keep up with Kourtney Kardashian, you’re going to have to head to Washington, D.C. The mom and reality TV star joins TODAY to talk about how her push for new regulations on personal care products took her to Capitol Hill. As a board member of the Environmental Working Group, I'm so proud of Kourtney Kardashian for supporting cosmetics reform!' the 60-year-old actress gushed. Kourtney's talk show appearance was far more serious Thursday with her promoting the Environmental Working Group and California Senator Diane Feinstein's Personal Care Products Safety Act on the TODAY show. Her advocacy on the issue has even taken her to Washington, D.C. Back in April of 2018,she spoke at a briefing with Senate staffers from the Environmental Working Group, which pushed for legislation to better regulate cosmetics. Reprinted by AOL, CBS8: KFMB (San Diego, Calif.), Click2Houston and Yahoo!. USA Today: Kourtney Kardashian says her co-parenting style has a 'good message"
Smeared by the site are scientists Tyrone Hayes, Stephanie Seneff, and Gilles-Éric Séralini; New York Times reporter Danny Hakim and columnist Mark Bittman; well-known food and science writer Michael Pollan; nutrition and food studies professor Marion Nestle; public interest groups like US Right to Know, Greenpeace, Natural Resources Defense Council (NRDC), Sierra Club, the Environmental Working Group, and Union of Concerned Scientists; past and present CMD staff, and many other individuals ACSH does not like. PEGS a.k.a. polyethylene glycol, this ingredient can function as an emulsifier or solvent, allowing other ingredients to better penetrate the skin. The issue? PEGs are often contaminated with ethylene oxide (a known carcinogen) and 1,4- dioxane (a likely carcinogen), according to the Environmental Working Group. The earth-friendly products use essential oils instead of chemicals for fragrance, and don’t contain the following harmful ingredients the Environmental Working Group (EWG) advises you avoid: ammonia, chlorine, glycol solvents, parabens, phthalates, formaldehyde, artificial colorants, phosphates and petroleum distillates. I certainly can’t say that these options are all natural drugstore makeup brands, but they are safe according to the EWG. To find which products were considered toxin-free makeup, I used an app called Think Dirty (which is pretty strict guidelines) and also checked out the EWG Skin Deep for ratings which I also trust for finding safe cosmetics. Their popular Moisture Cream has just 14 ingredients that you can read and understand, all with a low-risk Environmental Working Group (EWG) rating. The brand carries a small but substantial line with just the necessities – cleanser, toner, and moisturiser. The Environmental Working Group also joined with the Kidney Foundation to raise concerns and added it to its Dirty Dozen guide to food additives. The Environmental Working Group, which is historically skeptical of GMOs, declined to comment for this story. Similarly, the Non-GMO Project also declined a request for comment. Both organizations believe that consumers have a right to know whether or not the food they buy contains GMOs. Those wary of GMOs cite concern about potential long-term health effects connected to relatively new technology used in genetic engineering. Klement recommends EWG’s Healthy Living App which is free and rates more than 120,000 food and personal care products. The author remembers using the app while sitting on the floor of Whole Foods and scanning more than two dozen home cleaning products before she found one that met her requirements. The average level of glyphosate found in cereal samples (360 parts per billion) was more than twice the level set by scientists at Environmental Working Group for lifetime cancer risk for children. The average level of glyphosate found in pinto beans (509 ppb) was more than 4.5 times the benchmark. Instead, she recommends consulting the Environmental Working Group’s annual “Dirty Dozen” and “Clean 15” lists. The group analyzes the U.S. Department of Agriculture’s Pesticide Data Program yearly report and figures out which conventionally grown produce has the most and least pesticide residue. This mineral sunscreen by Kiss My Face is one of the select few that’s earned a No. 1 rating by the Environmental Working Group for safe sunscreens for kids. Reprinted byYahoo! Entertainment and Yahoo! Finance. David Andrews, senior scientist at Environmental Working Group, agreed. “EPA's inability to protect human health is frightening,” he said. Olga Naidenko, senior science adviser for children’s environmental health at the Environmental Working Group, an environmental health nonprofit, said: “If I were to read this letter . . . I probably would have done what I had done before. I think a public housing resident would take it as the water is OK.” Reprinted by AM New York. A 2016 study by researchers from Harvard, the University of California–Berkeley, the University of North Carolina, and the EPA found that the drinking water for six million US residents exceeds the EPA’s voluntary limit. Environmental Working Group has a map of sites across the nation where drinking water is potentially contaminated with worrisome levels of PFAS. The Environmental Working Group, a national advocacy nonprofit, also accused the EPA of not doing enough to determine whether GenX and other replacement chemicals are safe. “Given what we know now about its hazards to human health, the EPA should have done a lot more research on GenX before approving it as a replacement for PFOA,” said Olga Naidenko, senior science advisor for EWG. A 2018 report by the Social Science Environmental Health Research Institute at Northeastern University and the Environmental Working Group documented contamination in 94 sites, in 40 states. Olga Naidenko, senior science advisor for the Environmental Working Group, a national advocacy nonprofit, also said the EPA “should have done a lot more research” before approving the substitutes. Reprinted by WITF (Harrisburg, Penn. ).